Crescent Star Cake – Hello Holy Days! Shaped cakes are great for celebrating holidays with kids. 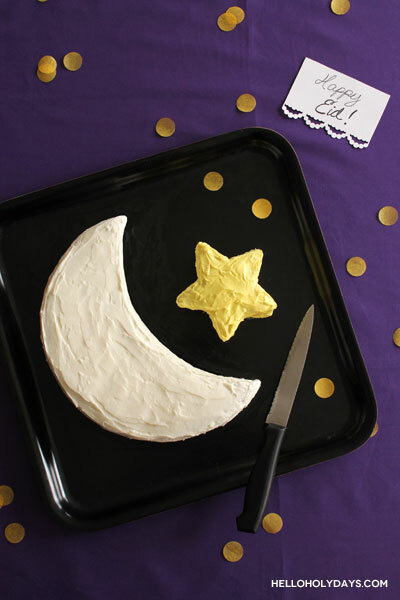 This cake takes the shape of a crescent and a star – perfect for Eid or Ramadan parties. You don’t need any specialty pans to bake this cake – simple round ones will do. Use the leftover scrap to make cake pops or a trifle. The leftover pieces are also great if you’re serving to a group that includes people who prefer to eat plain cakes over frosted ones. If you’re short on time, you can always freeze the leftover bits and use them later. For a video on how to cut a crescent and star shape from a round cake, check out our Youtube channel. Use a cake level or a serrated knife to even out the tops of both cakes. Stack the cakes on top of each other. Here, cakes were baked in two 9×1″ pans allowing for easy layering. If using a single pan that’s 9×2″, cut the cake into layers and then stack layers on top of each other. Place one of the cake pans used for baking the cakes, on top of the stack. Use this pan as a guide to help cut the crescent shape. Place the star template on the leftover portion of the cake and cut around it. In a bowl, colour some vanilla frosting with yellow food colouring. 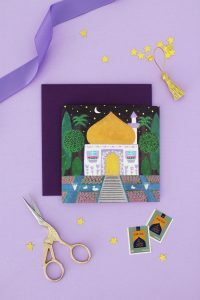 Remove the first layer of cake from both the crescent and the star and spread a dollop of frosting, white on the crescent and yellow on the star. Place the layers back on, and apply a thin of coat of frosting on both the crescent and the star to seal in the crumbs. Refrigerate 30 minutes. Apply the final coat of icing, white on the crescent, yellow icing on the star and serve.